I ran across an article by John Doble taking me to task for suggesting that we cut defense spending by 75 percent. Both articles date from 2012. I will respond to the most important parts of his article. How big a cut? Suppose our defense budget was the same size as that of Russia and China combined. I say this because the Pentagon sees them as our biggest threats. The Russian budget was about $61 billion in 2017. The Chinese budget was $175 billion. Their sum is $236 billion. How about if we spent $236 billion? Shouldn’t that be enough? Are we not as efficient as our two biggest Pentagon-identified threats? Trump’s 2019 budget, already passed, is $716 billion. If we reduce our budget from 716 to 236, that’s a 67 percent reduction. It’s not worth arguing about the difference between 75 percent and 67 percent because we spend another $50-70 billion on intelligence. Doble’s main point is shared by our cadre of experts in our military and government. The establishment view is that our defense spending buys international peace. Is this true? If it’s true, then we should see two things. We should see that low spending on defense is accompanied by more war and that decreases in spending generate more war. Conversely, we should see that high and higher spending generate less war. Where is the evidence to support these claims? I see no evidence to support the establishment view. If anything, the opposite is true. Here’s a chart of actual defense spending as a percentage of GDP. North Korea attacked South Korea despite our high spending (10% or so) and the knowledge that we had just defeated Japan. North Vietnam attacked South Vietnam also when spending was high (10% or so). We joined these wars partly because we already had big defense spending. 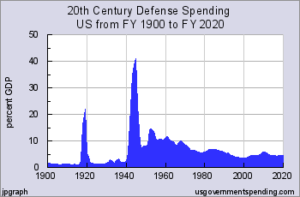 Relative quietude occurred as defense spending fell between 1975 and 2000 (to 3-5%). We made wars recently on Iraq, Afghanistan, Libya, Syria and Yemen. One reason for this was that we could. That was because of defense spending. It didn’t buy peace. It created a war machine that our leaders made use of. Notice that the Cold War came to an end in 1989, which was amid the period of falling defense spending, a small bump up having occurred under Reagan. None of these cases support the much-repeated theory that our defense spending buys international peace. They are consistent with the opposite. Keeping the peace doesn’t require high levels of spending and a worldwide empire of bases and meddling in other countries. Potential foes need only be aware that if they attack us, we will mobilize and counterattack. Potential might is what counts and willingness to use it. They need to know that we have the wherewithal to build an overwhelming conventional counterattack, even if one isn’t immediately available. For nations that have nuclear weapons, they need to know that a nuclear attack on us will be met with a totally destructive retaliation. This actually means destroying the planet. All nuclear powers have a strong incentive for this doomsday reason to negotiate a nuclear-weapons free planet. Increased defense spending in this context raises intolerable risks. Trump Wants Brazil In NATO...To Help Oust Maduro?